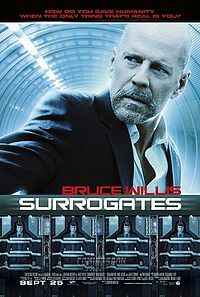 Surrogates, a science fiction film based on the 2005–2006 comic book series of the same name revolves around the mysterious murder of a college student linked to the man who helped create a high-tech surrogate phenomenon that allows people to purchase perfect robotic versions of themselves: being fit, and good looking remotely controlled machines that ultimately assume their life roles enabling people to experience life vicariously from the comfort and safety of their own homes. The morale of the story is don't let technology run your life, but in this day and age that would not be possible as technology slowly eats its way into our daily lives, making us more and more dependent on it. Would a scenario like the movie ever happen? Who knows?